Here is a brief description of each of the items pictured in SAMPLE PARCEL D1. The numbers or labels on the left of the title of the item correspond to the number or label in the graphic pictorial. One asterik* in the descriptions below indicate that there are NO DRAWINGS in this website to portray these pictures because I feel that there is nothing so unusual about their design that you could not find these drawings elsewhere. Two asteriks** in the descriptions below indicate that these buildings could have a flat, slightly angled roof to accommodate the sun-drying of fruits and vegetables, and/or for solar-cell photo-voltaic purposes. This is building #1, located precisely in the middle of Pictorial D1. It is a small white circle, with a smaller white circle inside it, with the number "1" in the middle of it. Looking at PICTORIAL D3a you see what the outside of this building might look like, as done in a glass/dome/cylindrical shape. Having a clear glass roof might allow for some solar-powered appliances, solar-cell battery chargers, and the like, to be utilized in a remote area, perhaps. Also a clear or translucent glass would allow for several varieties of plants to be grown there, that could not be grown outside (tropical plants?). In PICTORIAL D3b you see the "Floor Plan" of this building. 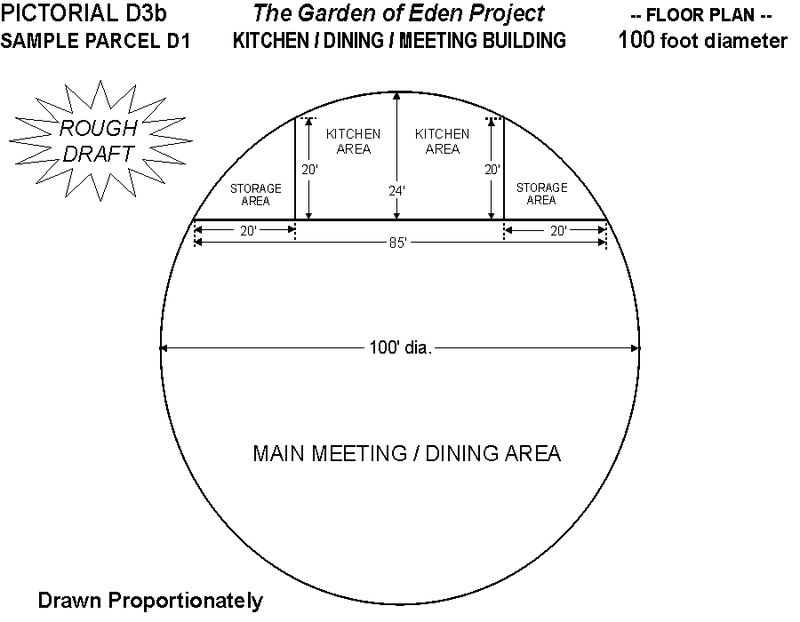 Notice the "Kitchen Area", at the top of the page, the "Storage Area"s on either side of the kitchen, and the majority of the rest of the area of the building could be for meetings, meals, or for various group activities, indoor recreation, movies, etcetera. Perhaps the building could be constructed of double or triple-thick layers of glass, with dead air spaces in between for insulation purposes. Also, perhaps the "walls" might be made to open, like doors, for hot summer weather, and closed up for cool or cold weather. Some areas of glass could be colored or tinted, as well as removable, for various seasons of the year. This is just a rough draft of this design, but this kind of building is certainly technologically feasible in this day and age (you just have to find a willing engineer & contractor). In most areas of the world glass would be more ecologically feasible than wood lumber. These are buildings #2, #3 and #4, located just outside the previously described building, in a "ring" of other small, rectangular buildings (#2 thru #10). These 3 FOOD STORAGE buildings could be large spacious rooms with appropriate ventilation and heaters to efficiently expedite the drying of fruits and vegetables in case of: cloudy, rainy or cold weather; or perhaps an extremely large crop. These buildings could have other miscellaneous uses during the off-season. This is building #5, located next to the previously described buildings, in the "ring" of buildings near the center of Pictorial D1. This building could be a simple, wide, open building. Some plumbing accommodations would likely be necessary if washers and dryers are used. If organic detergents are used, the waste-water could be used to irrigate the flower gardens, or maybe non-food producing plants. This is building #6, located next to the previous building, in the "ring" of buildings near the center of Pictorial D1. This building need not be too complicated, but it should have a strong floor, if it's going to be used for weight-lifting and other high-intensity exercises. Also it should be spacious enough to accommodate the equipment that would be intended to use. A good source of pure water and maybe solar-powered ventilation might be included into the design plans. These are buildings #7 and #9, located in the same "ring" of buildings as mentioned in the previous building descriptions. The design of these may depend on whether or not the people there use only these rest rooms, or whether they also have an individual residence bathroom. It may be wise to have both. It is my intention, in the design of this community, to live as organically as possible, and in doing so, my intention is that excrement from relatively clean, organic people be recycled back into the soil, in a hygienic fashion. Perhaps "visitors" to the community (or people who are extremely sick) could use these toilets exclusively, whereby the excrement will go through a septic system (a longer, more thorough "breakdown" of the excrement), for the health and safety of all. The healthier, cleaner people can recycle their excrement back into the soil in a quicker, more direct manner, although even theirs should be given a more than adequate amount of time to decompose back into rich, healthy soil, as talked about in the D1 Description. This is building #8, located between the previous buildings description, in the "ring" of buildings near the center of Pictorial D1. This building could be a simple, spacious room with several workbenches and several different-sized sets of shelves, against the walls and maybe a few in the middle of the room, to accommodate the various wide-range of tools needed by the community. An adequate number of solid, well made: rakes, hoes, shovels, pruning shears, and similar type tools will need a place to be stored, while not in use. It is probably wisest to have at least half as many tools as people, and therefore, places to hang these tools when not in use, in this tool shed. It would also probably be wise to have an adequate number of power outlets conveniently located in several places throughout the shop, near the benches, for power tool usage. Adequate lighting throughout, would probably be wise to have, also. This is building #10, located in the same "ring" of buildings as mentioned in the previous building descriptions. A standard architect's drawing of a large 3-car garage (made without wood lumber, of course, for ecological purposes) would do fine. Space for a complete set of auto mechanic's tools and equipment would likely be necessary. This driveway could be made of bricks, stone, asphalt or concrete. We don't need a very big road, because we don't expect any very large vehicles in here. Similar to the previous ENTRANCE DRIVEWAY, this driveable area could be made of bricks, stone, asphalt or concrete. Again, this doesn't have to be very big, only big enough for maybe pickup-sized trucks. In the center of the 8 groups of fruit and nut tree circles, in Pictorial D1, you see these small, red and white circles with the numbers 11 through 18 in them. These represent spaces for the 4-person residential dwellings. It is up to you as to what type of house, geodesic dome, yurt, tent, tepee, hay house, etc., that you wish to put there. I show a "rough draft" of a glass dome house in PICTORIAL D4. This design was intended for 4 people in each structure. Perhaps the top floor of this building could be constructed of double or triple- thick layers of glass, with dead air spaces in between for insulation purposes. Also, perhaps these glass "walls" of the top floor might be made to open, like doors, for hot summer weather, and closed up for cool or cold weather. Some areas of glass could be colored or tinted, as well as removable, for various seasons of the year. Having a clear glass roof might allow for some solar-powered appliances, solar-cell battery chargers, and the like, to be utilized in a remote area, perhaps. Also a clear or translucent glass would allow for several varieties of plants to be grown there, that could not be grown outside (tropical plants?). The underground walls and floors could be made of concrete and steel, for strength and long-lasting durability. Perhaps wall-to-wall, natural-fiber carpeting could be installed to keep these underground spaces well-insulated. There are also many books on dwelling designs at the libraries and at bookstores. Architects and engineers may also have many designs for these, as well. I hope you choose the most organic, ecological dwelling as possible. There are also many books on dwelling designs at the libraries and at bookstores. Architects and engineers may also have many designs for these, as well. I hope you choose the most organic, ecological dwelling as possible. I cannot help you more than this. I am not an engineer with a college degree, nor an architect. I am a visionary writer and artist with a science & engineering background. Scattered around Pictorial D1, you see these small red and white circles with the numbers 19 through 42 in them. These represent spaces for the 2-person residential dwellings. It is up to you as to what type of house, geodesic dome, yurt, tent, tepee, hay house, etc., that you wish to put there. (PP) PARK & POND AREA [52,000 square feet. See PICTORIAL D7. and Worksheet #8]: This area is about 1.66 acres, and is intended to be a leisurely recreational place for: taking a stroll; meditation; or just relaxing. The majority of the green area is a park-like area that perhaps could be as much as 10 feet higher than the surrounding areas, depending on the cost (both economical & ecological). However, dirt excavated from the housing sites might be used for this purpose. The light-blue area is the POND and is about 0.2 acres. This could be a shallow pond with a waterfall cascading down from the higher, above-mentioned PARK. The water could be re-circulated back to the top of the PARK by a solar-powered water pump. The green blobs in the pictorial represent some sample TREES and PLANTS, and are numbered to correspond to the plants and trees in the table beneath the pictorial. The table also features some fish that could maybe be used in the pond area. The little black rectangles are BENCHES. The rest of the pictorial is self-explanatory. This park and pond area ecosystem is what you could call a very limited ecosystem in comparison to a whole forest ecosystem, for example. The area here, being about 1.7 acres, would have no real place for larger animals, like deer and mountain lions, although there may be a place for wild rabbits, field mice, birds, a fox or two, and other small wildlife to habitate. This area is perhaps just a reminder of the larger forest ecosystems. (S) SAUNAS* [3 (qty. ); 20' diameter = 315 square feet each; all three = 945 square feet. ]: The location for one sauna is just below the PARK & POND; another one on the right is just below the TENNIS COURT and the third is in the left of the pictorial, left of the flower gardens. (there may be others at individual residences). These saunas are provided for their beneficial healing and soothing properties, for the betterment of all in the community and visitors. See your local library and bookstore for more information on how to build these. Rocks, stones, concrete and steel make good, durable and ecological building materials. (H) HOT TUBS* [3 (qty. 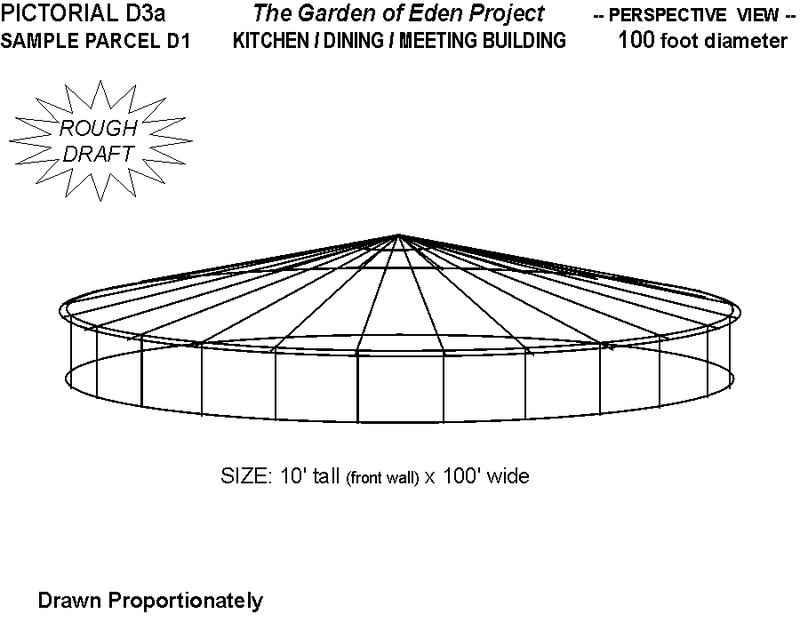 ); 20' diameter = 315 square feet each; all three = 945 square feet. ]:(Similar to the previous, SAUNA description.) These hot tubs are all next to the SAUNAS, one hot tub next to each sauna. (A) OUTDOOR AMPHITHEATER [50' foot radius, 1,963 square feet. See PICTORIAL D10]: This is an area for outdoor theatrical plays, skits, classes, workshops, lectures, meetings, etc., when desirable, both for residents and for visitors, as on a sunny day or a pleasant evening. This would be a larger area than the GAZEBOS for holding such events. Stone would make a fine building material that could last a very long time. This OUTDOOR AMPHITHEATER is located below and to the left of the Park & Pond area of Pictorial D1. (F) FLOWER GARDENS [3 (qty. );60' diameter = 2,827 square feet each: all 3 = 8,481 square feet. See PICTORIAL D9. ]: Ah, yes, wouldn't it be great to have a place to go to, to get a breath of fresh air...a place to sit down on a bench and relax ......let all your problems go.......to feast your eyes on the vivid colors of Nature at its best.....smell the sweetest fragrances on Earth..... to hear the gentle gurgle of a water fountain constantly flowing......a place of peace.....perhaps a place to do one's meditations.....a place to collect one's thoughts.....a place to become re-inspired, away from the work......a place to rest and "restoreth" the soul.......a place where you can ponder the true meaning of: "One is nearer God's heart in a garden than anywhere else on Earth!" And...as Claude Monet, the famous French artist / gardener once said: "What is God, if not an Eternal Child, forever playing in His Eternal Garden?" The flower gardens are located: 1) just below the PARK & POND area in PICTORIAL D1; 2) to the left center of Pictorial D1; and 3) to the right center of PICTORIAL D1. PICTORIAL D9 shows a sample flower garden, and beneath the pictorial is a table with the flower names and data corresponding to it. There are 8 sections (A through H) and 72 different types of flowers in this garden. This flower garden was designed for a SUNNY location, with various types of soil, and mostly moderate watering. (R) RECREATIONAL FIELD* [200' X 150' = 30,000 square feet]: This is about 0.69 acres, and is merely a big, open grassy field located to the left of the CENTER AREA in Pictorial D1. This field could be used for: open-field sports; pet livestock grazing (maybe, if they don't graze around the trees); or special outdoor community events (e.g., a musical event); or maybe for extra guests to camp upon; whatever the community decides. (T) TENNIS COURT* [36' X 78' = 2,808 square feet]: This, also, is for recreational purposes, to help people get their fun and exercise, if they need to. This court is located to the far right of the CENTER AREA (CA) in PICTORIAL D1, by the basketball court. (B) BASKETBALL COURT* [50' X 75' = 3,750 square feet]: This is obviously for recreational purposes, to help people get their exercise and have some fun, too! The court is located to the far right of center in PICTORIAL D1. (not labeled) BENCHES* [80 (qty. ), 3' X 10' = 30 square feet each, all 80 = 2,400 square feet]: These benches can be made out of metal, stone or concrete. This way they last longer and don't require trees to be cut down for building materials. (W) FOUNTAINS* [20' diameter = 315 square feet each: all 3 = 945 suare feet. ]: These 3 main fountains, located centrally near the Park & Pond and also located near the 2 other FLOWER GARDENS, (some yards around the houses might also have fountains), could be solar-powered, so that they turn themselves on when the weather is sunny and they increase the volume of the water-spray when the weather gets really hot. This would help the plants in the area adapt to the hot sun by putting more moisture in the air. Of course the fountain is also there to run through for people on a hot day, too, perhaps after a game in the recreational field! (Z) GAZEBOS [3 (qty. ); 30 diameter = 707 square feet each; all three = 2,121 square feet. See PICTORIAL D6]: One GAZEBO is located in the PARK & POND area. The other two are near the other 2 FLOWER GARDENS. These buildings could be used for a place for individuals to go: to have some "space"; to enjoy the evening; to spend time with a loved one; to be under shelter outside when it rains; or to escape the sun when it gets too hot. It could also be used as a place to have smaller meetings. (E) EXTRA STORAGE BUILDING* [50' long X 50' wide = 2,500 square feet; (10' high at the door)]: This is a building** to store extra gardening equipment, etcetera. (L) PET LIVESTOCK SHELTER* [35' X 40' = 1,400 square feet]: This building is located in Pictorial D1, just below the RECREATIONAL FIELD. It would simply be an area for the animals to stay at night, to stay out of the rain, etcetera. These animals are raise only as pets, not to be eaten as meat! (not labeled) GRAPE ARBOR [(hexagonal) 594 square feet. See PICTORIAL D8]: This structure is located in the center of the GRAPE VINEYARDS, which are right below the RECREATIONAL FIELD in Pictorial D1. A close-up is also shown in PICTORIAL D8. This structure could be made of large, recycled, old (but sturdy) wooden posts, or maybe, better yet (to last many years), steel-reinforced concrete, stone and/or colored glass. The idea is to train the GRAPE VINES to "climb" in a spiral around the posts overhead. Tables and chairs could be placed under or near the vines to provide a place to have maybe a "grape-harvest party" when the fruits come into season. For that matter, the arbor could be used in the off-season, too. (P) PARKING LOT* [170' x 170' = 28,900 square feet]: This area is about 0.66 acres and is intended for residents of the community as well as visitors. It is located at the bottom center of Pictorial D1. (L) GARAGE (for cars)* [(approx.) 60' X 35' = 2,100 square feet]: This garage is located just above the PARKING LOT in Pictorial D1. This garage is a repair facility, not to be confused with a parking garage. It too should be ecologically oriented. (C) COMPOST BINS* [16 (qty. ); 15' X 25' = 6,000 square feet each, all 16 = 16,000 square feet]: Each compost bin serves 5 people in this plan. Each bin could be divided into 8 sections, all 5 people using one section per week. It would take 8 weeks (2 months) to complete one cycle to convert compost into rich soil. Human excrement could be cycled in with the compost, at least for the first few years until there are no longer any one season crops grown under the fruit and nut trees, at which time the excrement could be buried under the trees as described in the DESCRIPTION of Sample Parcel D1. (M) MANURE DROP-OFF* [30' X 40' = 1200 square feet]: This is simply a place to drop off large loads of manure, e.g., from a local horse or dairy farm. This is designed to be most convenient for a large commercial truck. This bin is pictured as a small solid brown box located at the bottom center of PICTORIAL D1. This bin could also be used as a place to "age" human manure, perhaps as an "emergency" overflow, to give it time to decompose sufficiently to be safe enough to use in the edible gardens as natural fertilizer, like the animal manure.See SAMPLE EXCREMENT BURIAL PLAN DESCRIPTION for more related information.